Brown sugars (light and dark) are produced from a blending of white sugar and natural or processed molasses. They are made from sugar cane or sugar beets and add a delicate sweet flavor to a wide range of foods. Light (golden) and dark brown sugars are classified as either sticky or free-flowing. Most of the mass-produced products are a blend of purified, or refined, sugar and molasses. Raw cane sugars that have a brown coating also fall into this category. Piloncillo (little pylons) is a Mexican unrefined brown sugar with no molasses, but is similar in taste to American versions. The compressed hard cone can be scraped with a serrated knife. It is sold as light or dark. In India, palm, or jaggery, sugar is the brown sugar used most. It is available in hard cones or in pourable form and also is very popular in Thai recipes. 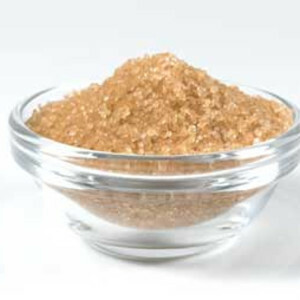 Other derivatives of raw brown sugars are labeled “muscavado,” “turbinado,” and “demerera.” These must be refined to some extent for sale in the U.S. to remove impurities and bacteria. Brown sugar is also available in liquid form. Store brown sugar in a cool dry place. Place boxes or bags in an airtight container. Hardening is a common problem. To restore, spread on a foil-lined cookie sheet and bake for about five minutes in a 250-degree oven. You can also add a slice of bread or piece of apple – in a separate unsealed bag - to the container and leave for two days. Brown sugars are not just for sweet recipes. They are used in such savory foods as baked beans and barbecue sauces. The choice between light and dark is a matter of taste preference, but darker color will have a heavier molasses note. Unless a recipe states a specific type, it is acceptable to use either. Dissolve a little brown sugar in coffee for a pleasantly sweet taste. For most recipe measurements, tightly pack brown sugar. To replace dark brown sugar, use one cup granulated white plus two tablespoons molasses. When a recipe requires brown sugar, using a substitute of any kind may affect texture and flavor.